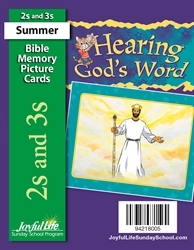 These colorfully illustrated cards include the verses that 2s and 3s will learn during the quarter. Children will enjoy taking the miniature cards home with them. *Includes 3 cards. Order one set per child.